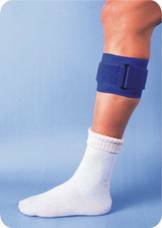 Special foam pad for additional pressure on the muscle of the calf without affecting blood flow. Available in attractive Blue / Gray colours. Provides uniform compression, protection and support to strained muscles and shine splint. It retains therapeutic warmth in a affected area. warmth encourages blood vessels to dilate and so allows more blood to the injured area and promote healing.